Father Tim Kavanagh ponders the past and looks to the future in Mitford, his beloved North Carolina mountain town. A few years into his retirement, following a trip to his hometown—where he discovered an unknown half brother—and a journey to Ireland, Father Tim and his wife, Cynthia, are back in Mitford, and he has to decide what to do with his future. Cynthia, a beloved author of children’s books, is always busy, but Father Tim is a bit at sea. A humble man who believes in the power of prayer, he knows God will provide. He turns down the bishop’s request that he return to his old parish after the incumbent admits to adultery and attempts suicide, but he does take on the job of running the village bookstore while the owner is on bed rest for a dangerous pregnancy. Dooley Barlowe, the young man he raised as his own, is well on his way to becoming a veterinarian after a dysfunctional childhood that left some of his scattered siblings still in need of help. Father Tim especially worries for Dooley’s brother Sammy, who seems lost and bitter. Father Tim lunches with old friends, continues to raise money for a children’s hospital, encourages Sammy’s interest in landscaping and fights to control the diabetes that caused his retirement. As he helps out the many friends and neighbors he has known for so many years, his path becomes clearer; as Christmas approaches, his heart is filled with joy despite the problems and doubts that beset them all. 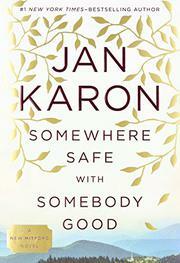 After a long hiatus, Karon (Light From Heaven, 2005, etc.) has returned with a novel that offers something for those who believe and those who do not. All the beloved quirky characters are here, the past is neatly summarized and the future, full of hope.